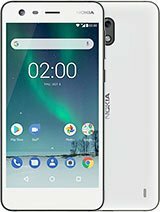 Nokia 2 is entry level smartphone. This device lanced November 2017. This phone comes with 5 inches LTPS touchscreen with a resolution of 720×1080 pixels. Nokia 2 power by 1.3 GHz Quad Core processor and it comes with 1 gig of ram and 8 gigs of internal memory. As far as this device has mid-range camera, the Nokia 2 packs a 8 MP rear camera and 5 MP camera for selfies. This device is runs with Android 7.1.1 Nougat OS and powered by 4100 mAh non-removable battery that can stand by 1340 hours. Big 4100 mAh battery that can be standby 1340 hours. Lower internal memory ( 8 GB ). 1 gig of ram is not enough nowadays. Type – LTPS IPS LCD Capacitive touchscreen with 16M colors.